As we approach the end of the US summer, the big guns of the Android ecosystem — HTC, Samsung and to a lesser extent Sony — have played their hands. These manufacturers traditionally square off in the early months of the year launch their annual flagships, and for the most part, that’s it. We generally see something more from each manufacturer in the latter half of the year in the form of larger (and in some cases, less successful) models — Note, Max and Ultra — but that’s generally about it. But times change. Over the last two years, we’ve begun to see a spark. Small at first, but growing brighter each time, the spark is the interest in what some have deemed – to their own folly it seems – the ‘lesser known’ Korean manufacturer: LG. 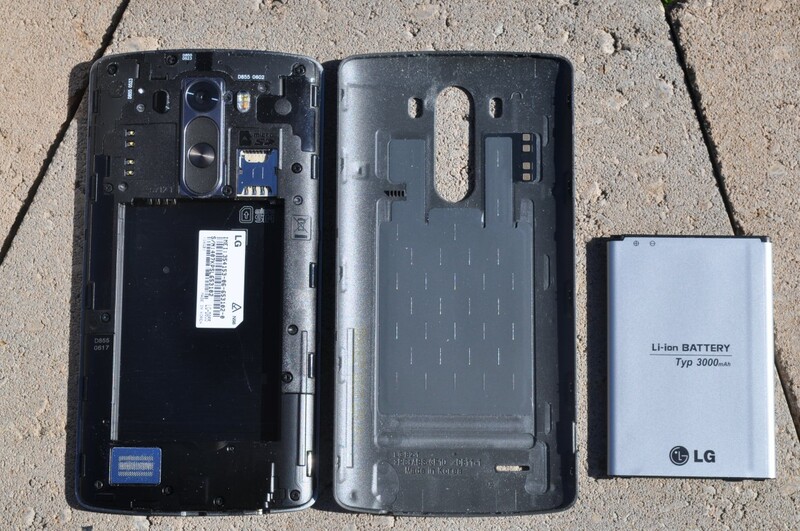 LG’s early entry into the smartphone market was not great. But over the last couple of years, they have clearly found their way. Closely working with Google on two brilliant Nexus phones, which may or may not have contributed to what appears to be a maturing software interface, as well as an ability to provide class leading hardware adopted by other manufacturers for their phones has led to anticipation in the masses for the launch of LG’s flagship line — the G Series. While it was the cheaper, good quality L Series phones which really led LG back to commercial viability in the Smartphone market, it’s the G Series which has really opened eyes. The Optimus G was written off in Australia due to late arrival, but still arrived with a beautiful hardware experience. The G2 gained a fan base due to a fantastic hardware experience and a maturing software skin and now we come to the G3, and we can’t say we haven’t been looking forward to it, and by the reception to stories, so have you. The LG G3 is leading the field this year, it has the highest resolution screen available in Australia and indeed almost all countries. It has a new and interesting new trick with the camera, which is normally associated with high-end camera equipment, the design has matured and software wise, the launch event showed off what LG has been thinking as they become a leading manufacturer in the Android landscape. It has all the makings of a dream phone in the hardware and software, but has LG put enough into the G3 to earn a place in your pocket? The LG G3 is just a monster when it comes to hardware. If there’s a piece of hardware that is available, then LG have gone to pains to ensure it was included. When it comes to the motto ‘Never Settle’, it’s the LG G3 which comes to my mind, not something else. LG has made great strides in terms of design over the last few years, this year they’ve moved ahead with a clean look with the G3. The phone is built around the flagship feature, a QuadHD (2560X1440) resolution screen, which dominates the front, with little to no bezel to interrupt your view of the gorgeous display. 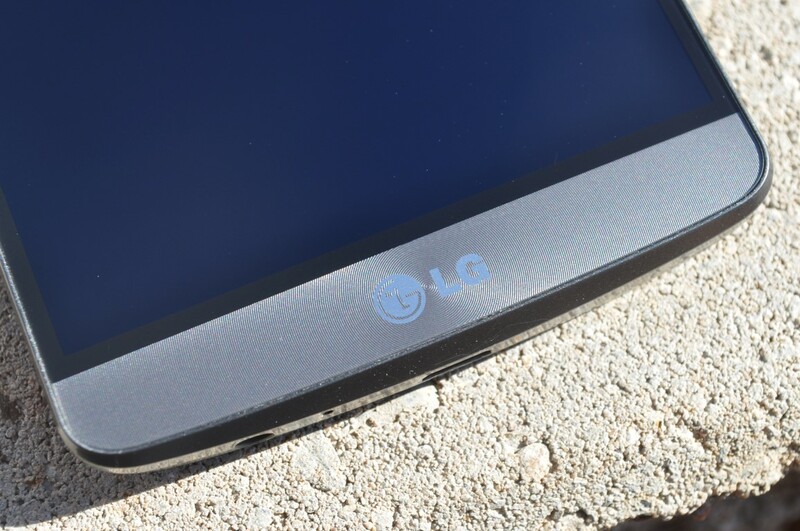 There’s a strip at the top with a speaker, front facing camera and ambient light sensor, while at the base is a strip of plastic, which contains a concentric ring pattern beneath the LG logo. The phone has a simple sweeping outline with a clean silhouette, unbroken by protrusions like volume or power buttons, which LG has again mounted on the rear. It was a bold decision last year when they showed it off on the G2, but it’s allowed them to achieve an almost bezel-less border to the screen on the G3. The rear mounted keys are again easy to use, your fingers rest naturally on the controls when you hold the phone. The keys have been slightly re-worked, with a more clearly defined texture on the volume keys, which also seem slightly deeper and a more easy to feel power button. With nothing at either side of the phone, the only ports or parts of note are mounted at the top and bottom of the phone. On the bottom you’ll find the microUSB port (mounted the right way up) as well as a 3.5mm headphone jack. The top pretty much contains the IR port which makes a welcome return and allows you to use your phone as a universal remote thanks to the QuickRemote software LG supplies. It’s also the lack of bezel which allows the G3 to take on other flagships in terms of profile. At 5.5”, the G3 has the largest screen of the main-stream flagship phones this year but LG have managed to make the phone shorter (by a mm) than the HTC One M8, and only marginally wider than the Samsung Galaxy S5. There’s no getting away from the size of the phone though. That massive screen while great for viewing content on, watching videos and just using in general is also quite wide. If you’re comfortable using a phone with two hands, you’ll have no problem with the G3, if however you like one-handed use, you’re going to struggle with it. That said, it’s very nice to hold, and there’s a reason why. The phone has a nice curved line around the whole unit. The screen slides into a metallic looking band before curving gently to the removeable rear cover of the phone. The rear of the G3 is made of a plastic which looks somewhat similar to what was on the LG G Flex, however it doesn’t have the same ‘self-healing’ properties from that phone. It’s a nice feeling plastic however, which allowed them to keep the price, as well as weight down. The plastic is, well, it’s nice. It has a slightly textured feel to it, making it easy to grip and it also doesn’t attract fingerprints, a nice bonus. But looks aren’t all that the G3 has, it’s got power to boot. Like the Snapdragon 800 which powered the majority of smartphones last year, this year the processor of choice is Qualcomm’s MSM8975AC Snapdragon 801 processor. Clocked at 2.5GHz and paired with an Adreno 330 GPU to drive that massively high resolution screen, the G3 has a great base to work from in terms of power. LG made two versions of the G3 this year, one with 2GB of RAM and 16GB of storage, which is what we’ll see in Australia and other markets, and a model with 3GB of RAM and 32GB of storage which LG will sell in various markets around the world. Storage wise, the inclusion of a microSD card slot somewhat lessens the impact of having only 16GB to start with, but the extra RAM is something we’d love to have a play with down the line. The decision to bring the 16GB version to market, can most likely be laid directly at the feet of Australian carriers. 32GB phones are still mostly unheard of in the Australian market, and the additional cost may have caused carriers to baulk at attempting to sell a slightly higher priced LG phone in a market already used to purchasing 16GB versions of HTC, Samsung or Sony handsets. With the G3 camera, LG had big boots to fill. The LG G2 included a 13MP Rear Camera, with Optical Image Stabilisation (OIS) and was a solid performer in both good, as well as low-light conditions. While HTC eschewed OIS (and megapixels) when they updated their HTC One, LG decided to maintain the status quo with the G3 and included the same resolution sensor as well as OIS, but added something special – Laser Auto-Focus – something only seen on high-end DSLR cameras, until now. The power source on the G3 is a 3,000mAh battery made by LG Chem, but unlike the G2, LG has decided to make the battery removable. This also led to the introduction of interchangeable coloured backs available as accessories, as well as QuickCircle cases and more. The G3 includes wireless inductive charging, a feature which has been slowly coming into mainstream use phones built by LG over the last two years, with almost all the accessories provided for the G3 coming with support for this inductive charging. The phone has a solid feel to it. The removable rear cover snaps on and off with a solid feel, there’s no flimsy plastic cover here, it’s all premium. The phone isn’t overly light, but definitely not heavy, it’s what I would describe as nicely weighted. The phone sits comfortably in the hand with no sharp corners to cut into your hand or make it uncomfortable to hold, but it is a BIG phone, so one-handed use is going to be a stretch if you don’t have large hands. Overall, it’s a plastic phone, but I’m ok with that. Adventures with the HTC M8 with the body heating up while being used intensively, have certainly given me pause in my quest for an almost completely metal phone. Oh that screen. LG makes GREAT screens, arguably some of the best screens in the world. If you’ve seen or used an LG TV, you know that they can make great panels, and this talent translates well to the small(er) mobile screen. Previously, their screens were built into other phones known for having great displays, but LG are putting themselves first these days and if you love a good screen then the G3 will certainly satisfy you – immensely. The G3 screen is without doubt Beautiful with a capital B. It gives the same excellent colour depth and true colour reproduction we’ve come to expect from LG, showing vivid colours and brightness. The screen is easily viewable inside or outside without any issues, the ambient light sensor adjusts the brightness beautifully, adjusting to make sure you’re viewing it at the nicest possible brightness. The resolution is one of those things that you’re going to appreciate without quite knowing why. If you picked up the G3 without actually being aware of the QuadHD resolution, you’d think it was just an excellent 1080P panel. It’s when you get down to the nitty gritty and start looking for reasons why you need the 2560×1440 resolution that you begin to understand just how good the screen is. Viewing 2K content like the sample video that LG supply on the handset, or the 2K content you can find on YouTube is simply stunning, but it’s when you start looking closely at text that you start to see what a 2K resolution display can do. No longer can you see the pixels which make up the characters in text, instead they begin to look almost like an organically drawn font. The screen is great, and that’s what counts though. If you’re looking to be blown away by screen quality it’s just not immediately apparent, but you’re definitely not going to be disappointed, It’s got the great viewing angles, and display quality you want, and in the end that’s all that matters, but the big question is: has that big resolution affected the battery life? LG has been a leader in battery technology for a long time. Motorola used the LG battery technology in the Moto series, making for excellent battery life. The LG G2 and G Flex both had excellent battery life, the G3 is no different. I am without doubt hard on battery life. I can run my Nexus 5 down from a full charge to nothing within about 2-3 hours. I use phones constantly and often take the auto-brightness off and just push it all the way to get the full effect. My screen-on times are usually measured in a mere couple of hours per day, the G3 did not let me down. A typical day for me is removing the phone from the charger at around 7am, then it’s Twitter, Google+, Email, YouTube, Chrome, BaconReader, podcasts and generally stuffing around on the phone every few minutes. On a particularly bad day I will even tether to a Chromebook for an hour or so. The good news, the G3 is up to the challenge, easily getting me through the full day without charging. Screen on time has been, well, Awesome. With around 4 hours or more of screen on-time across the day – one day came close to 5 hours – with around 14-15 hours of battery life. But there are smarts involved with the G3, LG has also incorporated battery management into the software of the G3 to help extend the potential life of your phone. This does of course mean that your smartphone becomes slightly less ‘smart’ as the battery life is saved, but it will mean you can send and receive SMS messages and make phone calls. Battery Saver kicks in at 30% battery life left by default, switching off functions such as WiFi, Auto-Sync, Bluetooth, Screen Vibration and changing screen brightness and timeouts. These battery saver settings work, to an extent, you of course lose a lot of the ‘Smart’ functionality of your smartphone, but if you need to make calls or message someone you’ll be good to go. The G3 also comes with Wireless charging. The phone has built-in support for Qi chargers, and it has worked pretty well with the Nexus wireless charger I purchased from the US. It does tend to be quite funny about being positioned exactly right, so there’s a fair amount of stuffing around with it before you can get it charging. I am keen to try out the official charger at some stage to see whether this positioning issue is resolved by the official part. LG has built a phone around two really great hardware features, that screen, and the camera, it’s not just a good camera, it’s a great camera. The camera on the G3 includes a 13MP rear camera sensor with built-in Optical Image Stabilisation (OIS), pretty much what they included in the LG G2. 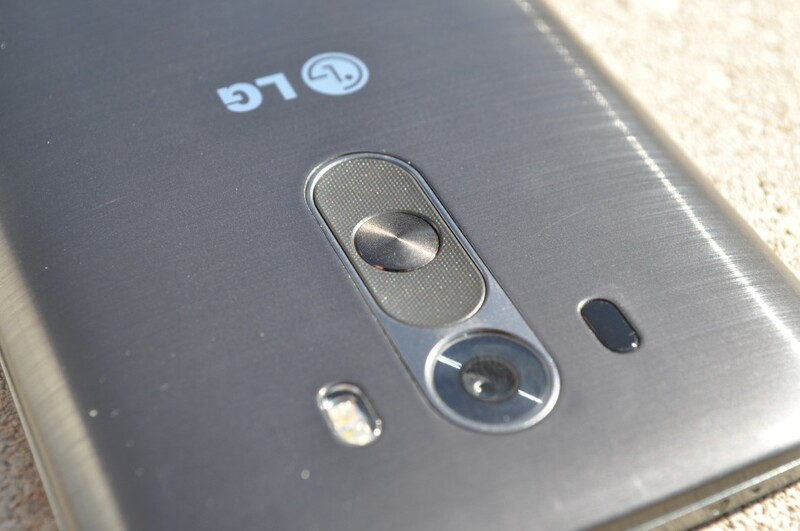 But that’s last years tricks, this year, LG has included Laser Auto-focus on the G3. LG has decided to use Laser Auto-Focus as opposed to Phase Detection Auto-Focus because lasers are faster. Laser Auto-Focus allows the camera to focus in just 0.276 seconds – it takes 300ms for the human eye to blink – meaning that as soon as you want to take a shot, the LG G3 is theoretically ready to go. 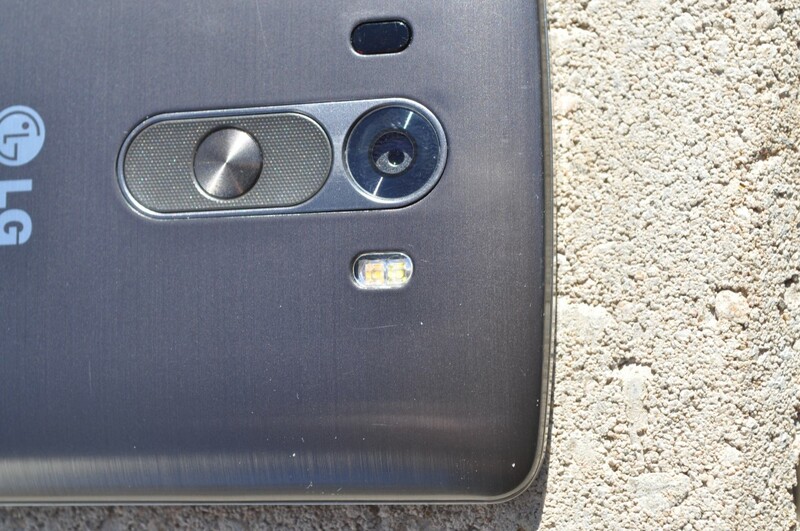 The LG G3 Laser Auto-Focus consists of a small laser embedded on the rear of the camera to the left of the camera module. The laser is visible, if you start the camera app you can see a small red light in the window. While LG were unable to advise the actual power of the laser, it doesn’t appear to be terribly powerful, so it’s not going to burn out any retinas, but it will get you quite a good shot when you use it. The camera software hasn’t received a massive amount of updates. There’s the same nine focus points that allow you to select a focal point, but essentially the whole screen can now be used to capture images. Tap anywhere within the video and you’re taking a shot, the camera focuses where you tap and takes a shot, quicker than you an ever focus then move your finger to a shutter key. The LG G3 offers an array of options for still shot as well as video. Still Shots go from 3MP (2048×1536), through 9MP(3120×3120), W10MP(4160×2340) and up to 13MP (4160×3120). You can choose to apply HDR, or opt for leaving it off, or have the phone apply it automatically. Also offered are options for a variety of modes : Panorama, Dual Shot (Want to be in that photo but not really?) and you also get Magic Focus. Magic Focus is LG’s way of taking a photo and allowing you to change the focus after the fact – it works too, even without a dual-camera setup. Selfies! They’re the guilty pleasure of many people, and LG has brought the voice capture options back – use the commands – ‘Cheese’, ‘Smile’, ‘Whisky’, ‘LG’ or ‘Kimchi’ (Korean for Smile) and the phone will take a picture. It’s fun, but don’t leave the camera app open when you’re watching TV or you’ll have any number of shots of nothing. This year there’s a new, fun option ‘Gesture Shot’. The Gesture shot will let you take a selfie with a hand gesture. Hold your hand up, fingers raised and the camera locks onto your hand, clench your fist and a three second timer begins before taking a shot. With a 2MP front-facing camera you will indeed get a good shot out of the G3 front-facing camera, it’s nowhere near as good as the 13MP rear camera, but your Instagram Duck Face will look more than acceptable. Just using the phone as a camera, the photos taken on the G3 are great. In full light they look amazing, in low-light, using OIS, the camera takes a great shot with the added benefit that you can then zoom in on the photo without losing detail because, after all it’s still at 13MP. There’s a little graininess using OIS, but it’s still a far better shot than you’ll get out of a Galaxy S4/S5, and even the Nexus 5. Video wise, the LG G3 offers quite a decent array of resolutions as well. You can take HD video (1280×720), FullHD (1920×1080) and UltraHD (3840×2160). The video from the LG G3 is great. the UHD video is quite large, but worth it, especially when you play back the content on the 2K resolution screen, because if you don’t create high resolution video content, there’s not a huge amount of people out there doing it. Full HD and HD video look good, but really, you may as well just take the full resolution shot – memories last a lifetime. The LG G3 also captures 120 Frames Per Second HD 720P video – that’s right the LG G3 does slow-motion video. The video captured contains 120 frames per second (normal video is run at 30fps), meaning you have 4 times more frames in your captured video than normal video. The actual video playback on your G3 is in Slow-Mo, but when you take it off, you will have to use a renderer to playback as slow motion video. Thankfully, if you want to share it you can, upload to YouTube and go to the Video Editor and then Enhancements, you can then select the playback speed (4x) and you’re off and racing. The LG G3 is a monster with regards to connectivity. There’s Bluetooth 4.0 with APTx (an audio codec), it also includes dual-band 802.11 WiFi a/b/g/n and ac, you get GPS, A-GPS, NFC, heck you even get an FM Radio – an exclusive to the D855 model on-sale in Australia. On top of all this you get 3G radios which work on all three major Australian carriers, as well as 4G radios which are fully compatible with all current – and most upcoming 4G networks here. The LG G3 connects to WiFi networks on both 2.4GHz and 5GHz bands. It’s a pretty standard test these days and the G3 doesn’t disappoint. GPS locks are delightfully fast, navigating with GPS is accurate and of course Ingress – Jason’s favourite – is a great way to test it out. Ingress works well with no GPS floating, it’s a solid lock. For more normal use, Google Maps works well. The LG G3 also supports Miracast, but it was shoddy at best, I have two Mircast adapters – an LG Miracast adapter as well as a Netgear PTV3000 – both failed to connect to the G3. Still Chromecast screen mirroring is here to help bridge that gap and from experience, Chromecast dongles are a lot more commonplace than Miracast adapters. The G3 also includes USB-OTG, you can plug in any number of devices: Mice, Keyboard and USB Drives – I tried my hard drive but it was the wrong file system. It’s handy if you have an OTG cable handy. LG has been delivering a solid audio experience on their phones for a number of years. Last years LG G2 delivered the first smartphone with High Definition Audio – offering studio-quality 24 bit/192kHz Hi-Fi playback, on the LG G2 the audio was outstandingly clear. LG has included a 1W Speaker with Boost AMP – and it’s amazing. The external speaker is crystal clear, and delivers a big sound, even as a rear facing speaker the G3 produces a clear, Loud sound. LG could have gone front-facing speakers, but would probably have run into issues with the design, so overall it was a good choice. There’s been a lot of talk about the G3 coming to Australia with 2GB of RAM, when a 3GB version is now available in various international locations. The phones both have a 2.5GGz Snapdragon 801 processor inside but it’s the 2GB vs 3GB RAM change that may make the difference. In day to day use, the G3 runs quite nicely, it loads apps, and switches quite smoothly, but it’s not absolutely consistent. There are occasional lags when loading a large file or switching apps. It’s still a pretty good experience, as a comparison for my money, the phone definitely runs a lot smoother than a Galaxy S5, but it doesn’t quite get to the smooth running that the HTC One M8 has. It’s right here where I would love to see the 3GB version of the G3 to see if that smooths out the occasional stutters. There’s one major issue with the LG G3 – Chromecast on YouTube. When trying to Chromecast from the YouTube app, you can, it works – but you’re met consistently with a crash error for the com.android.systemUI module. Paul O’brien from Modaco has narrowed this issue down to what he believes is ‘LG’s modifications to the SystemUI app to accommodate the new volume slider in the notifications pull down’. He’s fixed this with an XPosed module in his MoDaCo Toolkit, which requires root. 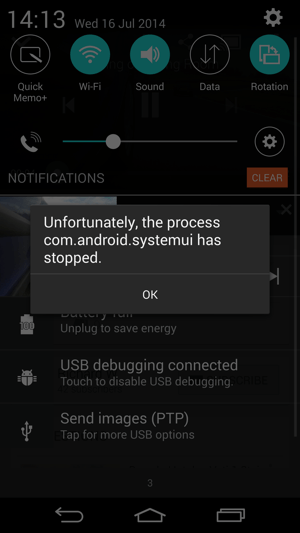 For plain vanilla LG G3 users, the issue persists and we’ll have to wait for an update for this to be fixed. I have asked LG about this but I am still waiting a response, this will be updated as soon as I receive a response. The LG G3 comes with Android 4.4.2, modified with LG’s UI. The updates to Android 4.4.3-4.4.4 are uncertain at this time, and we’re yet to hear back with regards to whether security updates included in the upgrade will come through as a standalone update. There’s been no plans announced to update the LG G3 to Android L when released, and LG has been a little slow previously with their updates, even for their flagship phones, but they seem to be getting better. The G2 is now on Android 4.4, so we’re hoping that with the massive sales increase the G series has seen in the last couple of years, that the G3 will see a timely update to Android L when it’s released. The LG skin has previously been a hit and miss affair, but one thing you cannot argue is that the LG skin has been maturing over the last couple of years, as LG has matured into a premium smartphone vendor. The G3 motto ‘Simple is the new Smart’ has been applied to the LG skin as much as the hardware. LG has aimed for a flatter UI on their current Android skin, which is in keeping with general smartphone UI’s across the board. The UI is minimal and ‘clean’ there’s no shadowing or embossing on icons, it’s really simple. LG has extended their new clean UI and design sense to the icons and colour palette they’ve used. They based the icons around their circle motif from their logo, and it all seems to be quite pleasant, but I just can’t get away from the phone icon (a square) or the camera icon (again, a square, albeit with a circle in the middle for the lens). That said, their other icons are decent and follow the flat motif that LG are going for. They’ve gone for a basic colour scheme which includes toned down colours as opposed to loud primary colours that we’ve seen previously. LG has chosen some basic colour schemes for their major apps – Dialler, Music, Calendar, SMS and Memo Pad – and stuck with them, it’s a visual reminder that they’re separate, it’s a bit extraneous, but overall, it completes what LG has done previously which is to make sure their UI is consistent all round. The UI touches all facets of Android, no piece is left untouched. From the quick settings — I maintain that LG and most OEMs do a better job than Google (at least until Android L arrives) — and settings menu, through the launcher and app drawer, it all looks like an LG phone and that’s Ok, if you’re trying to differentiate yourself, which LG is still trying to do. LG has even added flip and fold animations to actions when swiping or accessing the inbuilt apps and widgets, it’s meant to be part of their user experience and it’s again consistent with the LG UI. The UI uses a fairly light, easy to read typeface – NewSmartGothic – but it can be altered to any number of different fonts, available to download through the LG SmartWorld app. But, then this also applies to all of the LG UI, it can be changed in an instant. LG still welcomes change – as all Android phones should – by offering theming options through the LG SmartWorld app. There’s a range of options for you to change your theme, if you really want to with LG, but always remember that the Google Now Launcher – or indeed any number of wonderful launchers – to install from Google Play if you want. During the leadup to the launch of the G3, there was a lot of talk of a Smart Assistant. It’s true, sort of, there’s one there, but it’s called Smart Notice, and it’s not quite up to the title of Assistant just yet. Smart Notice will take note when you’re in meeting and let you send text messages to missed calls, and also remind you that you haven’t called that person back, even offering to add the missed call number to your contacts if you repeatedly call them. I found this helpful when calling the mechanic while my car was being serviced, Smart Notice, saw missed calls and callbacks to them and prompted me to add them, handy. Smart Notice is a conglomeration of different features which LG has built into their Android layer. It includes a health tracker, which includes an ability to track your steps (obviously you’ll need your phone on you), or your general activities, from running, through cycling and even roller-blading. It looks like it’s the start of something, which LG has bigger plans for down the track, right now, it’s a pretty bare bones implementation, but I will be interested to see where this goes, with LG’s fitness trackers and G Watch products. Smart Notice also gives you access to Smart Tips – a set of tutorials on how to use your apps on your phones. These are all stored away on the left most home screen, swipe to the left and you’ll get access to a whole range of Smart Tips. The Tutorials are for the most part fairly unneccessary, but are definitely worth having a look through, if only to find the one nugget of information you didn’t know about how best to use your phone. OEM Keyboards are terrible. There, I said it. But maybe not for much longer. The LG Keyboard has come a looong way. I used it for three weeks and I wasn’t inclined to change it. Options such as the Google Keyboard, Swiftkey, Swipe, Minuum, and many more are available, but the LG Smart Keyboard, like their skin has matured. LG has put a lot of work into their keyboard, going so far as to make it a key feature at the launch of the LG G3. The keyboard is much more configurable than previous versions, offering options to change the height and width, as well as customise the keys, with different characters if required. It’s not quite as good as it could be, but it’s a massive improvement on what they’ve had previously. There’s smooth animations which let you flick a suggested word up to the stream with a swipe, and the keyboard recognises those slightly missed keys and can increase the touch target size on keys you continually miss. There’s one niggling problem I have with the LG Keyboard – the letter i. When anyone types a single letter i, ANY keyboard on the planet should automatically capitalise the letter in the stream. Fix this LG and I’m 100% sold on your keyboard, it’s really good. There’s a few things that I’ve found on phones over the last year or so which are deal breakers if they don’t include them, double tap to wake is one of them. The HTC One M8 had it (Joy), the Nexus phones can be modified to include it, and the LG G2, G Flex and LG G3 all have it; and it’s wonderful. The rear mounted power button makes KnockOn – the name that LG have for this feature – a must-have. But it works so well it’s a killer feature and one you use constantly. KnockOn was sometimes hit and miss on the G2, but it’s improved exponentially in the G3. You’ll be double tapping to wake any phone you pick up after using the G3 and be disappointed if they don’t wake up. An extension of KnockON is the KnockCode security unlock, which allows you to set a security tap code, to unlock your phone. The KnockCode is set across four quadrants in the lower half of the screen, which allows for up to 80,000 possible combinations to try. Of course, Shave and a Haircut (Two Bits) is going to be default for most people, but adding the different quadrants will still allow for a measure of security. LG has bundled a few apps into the G3. It’s not overwhelming by any means. Of course with only 16GB of storage, you’re going to want to remove as much of the cruft as possible, but thankfully there really isn’t that much. Box – Get 50GB of space with your LG Smart Device until the 30th of September. Calendar – Not bad, but you’ll probably find Google Calendar a little better Camera – It’s the LG Camera Cell Broadcast – Used to send data to devices connected to a specific tower Clock – LG’s Clock app Contacts – Like the Google People app, but with the addition of Groups. You can send messages to multiple people in a pre-specified groups. Downloads – Download manager Email – Third party email app for IMAP and POP3 File Manager – A built-in File Manager application FM Radio – Your way to listen to FM Radio on the phone Internet (Browser) – this is the default Android Browser, but it’s ok, Chrome is installed as well. LG SmartWorld – your gateway to LG themes, fonts and more, worth a look. McAfee Security – Mcafee is included to offer a range of security improvements including: Find My Phone Remotely wipe device Backups Security Scan This is an added bonus, if you’re in need of that extra layer of security. Messaging – Your SMS app, if you don’t wish to use Hangouts. Music – Play all your music. Phone – Make Phone calls Quick Remote – That’s right, the LG G3 has an IR Port and can control Infra-red based devices in your entertainment stack. It’s pretty full featured and quite handy. QuickMemo+ – I LOVE QuickMemo, if you want to take quick notes, or annotate a map or picture, this is your best option. Simply swipe up from the bottom of the phone and the right hand option will let you select Quick Memo. Another note, is that QuickMemo is now backed up through Google Drive, indeed it shows up as an option when you first set up your phone as something to sync. Remote Call Service – If you need help from LG, they can use this to remote control your phone. Tasks – To Do lists are right here. Update Center – Check for updates to apps as well as phone updates. Don’t worry though, it’s automatically checking for any updates. Voice Recorder – A massive failing still in Android is missing basic apps such as voice recorder, it’s easy to use and worth keeping round. Weather – Weather supplied by AccuWeather, it’s the driving force behind the main widget on your home-screen. Some decent animations and a clean fresh look, but the lack of updates from the Bureau of Meteorology does mean that the weather information is just slightly off. When LG launched the G3, we managed to spend an hour with the G3, and I fell in love. That screen, the camera, it all looked wonderful. Spending more time with the G3 has cemented that relationship. While the size is just a touch too large, the software occasionally has a stutter, like any relationship, I’m going to just overlook the small foibles, because the overall is just so wonderful. The screen is just brilliant, reading on the G3 is amazing, as is watching video that suits the 2K display. The camera takes wonderful photos and video. Battery wise, LG has certainly done the trick again, with a powerful battery which even takes on the 2K display and comes out 14 hours later, with nary a worry, all day battery life IS possible. The G3 is, without doubt, the best phone I’ve seen yet, and I’m not going to let it get away. I’m not saying a Nexus phone later this year won’t be coming my way, but I am saying the LG G3 is staying with me: this phone does everything I want and more. Had the LG G3 for less than two weeks. Really liked it, only two cons was going back to mono sound (from HTC One) and the random restarting that seems to happen with quite a few owners too. Currently it’s with Kogan, crossing my fingers in hope it gets fixed as everything else is great. Thanks for the review, Daniel. I’m surprised the battery life was excellent, given the high resolution screen. Do you guys have a Motorola X 2014 yet? What are your first impressions and will we see a review? We’re hoping to get a new Moto X soon, but we’re unsure on time-frames yet. We’ll let everyone know as soon as we get one though. Quite looking forward to it. Are you able to voice dial over bluetooth? either with google now or any other programs. That was my biggest reason in going back to the note 3. I’d just like LG to make a statement about L.
Hmmm, I’d be happy if even only a fraction of that screen calibration made an appearance on my Nexus 5. Alas I can continue to use franco kernel colour kernel to try and pretend I have something approaching decent black levels. Gah… so much choice out there at the moment. So hard to decide on what to upgrade to. Those captured stills look good. Google seems to like them too – almost all the still shots I take with it end up Auto-Awesomed.